The international seminar Cartographies of the Unseen, produced by the Institut Ramon Llull with the support of Venice’s Iuav University and Barcelona’s Pompeu Fabra University (UPF), was held (May 15th & 16th, 2017) as part of Catalonia in Venice 2017_La Venezia che non si vede, a Collateral Event at the 57th International Art Exhibition – La Biennale di Venezia. 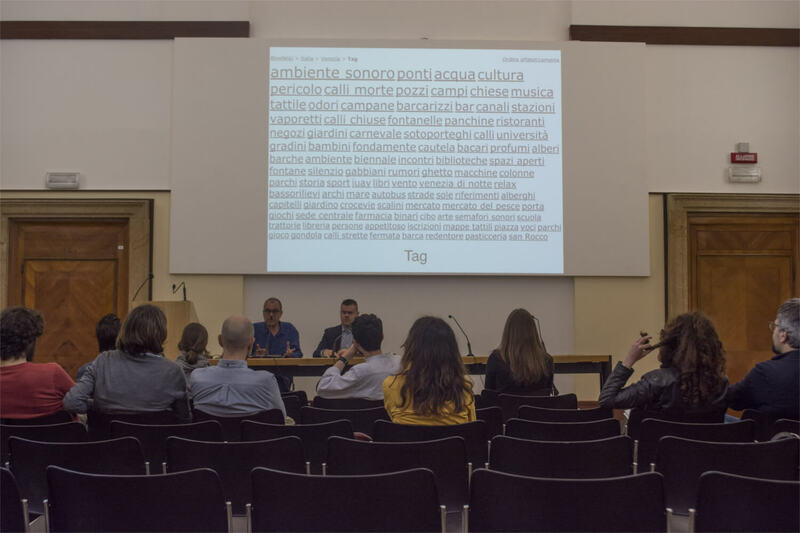 It was the perfect opportunity to present the work carried out by the community of citizens, volunteers, students and researchers which are taking part in the Venetian edition of the BlindWiki project. This Seminar brought together a selected interdisciplinary group of artists, activists and scholars who were invited to be active participants engaging on the collective research and creation of the unseen. Coordinated by Mario Ciaramitaro, researcher at Università Iuav di Venezia, and Roc Parés, co-curator of the Catalan project and researcher at Universitat Pompeu Fabra, the Seminar focused on the critical and poetic practices that include geolocating, sensorialization and social engagement, as means to research art and accessibility both in urban spaces and digital interfaces. The international seminar Cartographies of the Unseen is produced by the Institut Ramon Llull with the collaboration of the Dipartimento di Culture del progetto of the Università Iuav di Venezia and the Research Group on Digital Documentation and Interactive Communication of Pompeu Fabra University (UPF).